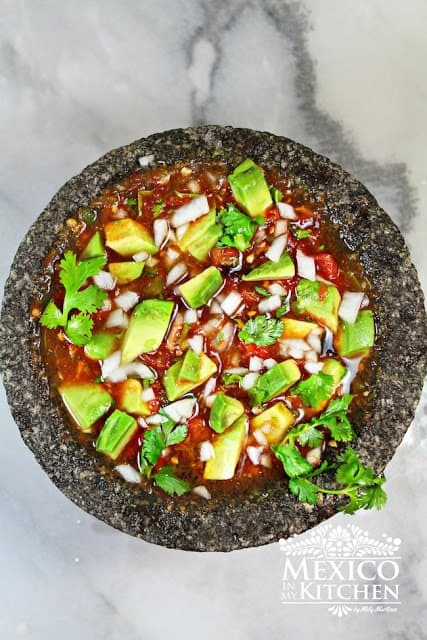 Salsa in Molcajete is a salsa ground by hand using the Mexican basalt-stone pestle & mortar called “Molcajete” (pestle in Spanish is “Tejolote”). 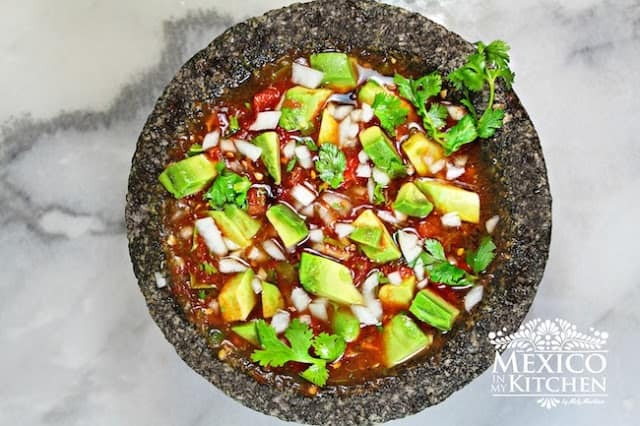 Nowadays, cooks prefer to use blenders or food processors to make salsas, but a salsa made in the molcajete will always have a special place in Mexican cuisine. 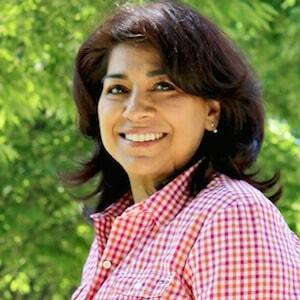 It evokes the meals made by grandmothers, in rural places where people prefer the flavors of hand-ground salsas. The little effort needed to grind the salsa in the molcajete by hand makes this salsa an easy and special treat. People still prepare it to go alongside grilled meats, poultry, fish, tacos, and tortilla chips. These salsas are also served at Mexican restaurants, where they’re sometimes prepared tableside. The ingredients are the basic tomato, peppers, and onion. If you don’t own a Mexican mortar, you can use a food processor or blender, just using quick bursts at low speed to get that coarse texture. This is a basic recipe that you can easily adapt to your taste; I mention this because some people don’t like their salsa too spicy. You can use other types of peppers like bird peppers, dried arbol peppers, or chipotle peppers; you can also use tomatillos instead of tomatoes. Other additions to this salsa are lime juice and seeds like sesame and pumpkin. Grind the garlic clove until it forms a paste. Cut the tomato and pepper into small cubes to fit the mortar and for easy grinding. Add the pepper to the mortar and proceed to grind. Continue with the roasted tomato, skins removed. Keep grinding until you have a nice salsa. You can grind to the texture of your liking, either coarse or very fine. Season with salt and stir in the chopped onion, cilantro, and diced avocado. Now, let’s get some chips! Salsa in Molcajete is a salsa ground by hand using the Mexican basalt-stone pestle & mortar called “Molcajete”. 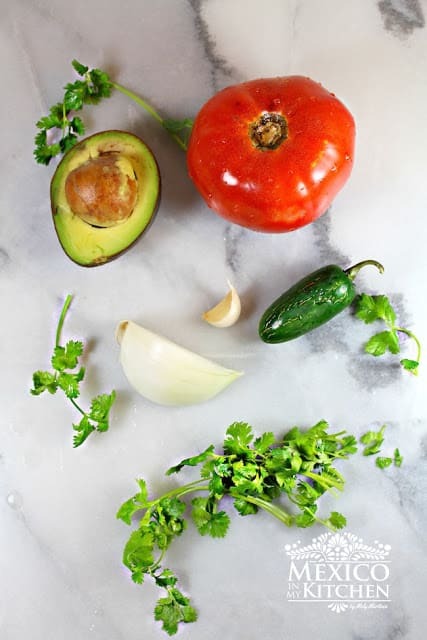 Nowadays, cooks prefer to use blenders or food processors to make salsas, but a salsa made in the molcajete will always have a special place in Mexican cuisine. ½ avocado diced just before serving. Place tomato, pepper, and garlic on a hot griddle to roast. Turn to roast evenly. Remove garlic clove promptly, since it roasts sooner and if burnt, will taste bitter. This step will take about 8 minutes until the tomato is soft and skins are peeling out. Season with salt and stir in the chopped onion, cilantro and diced avocado. You can either roast the ingredients on the griddle or place on a baking sheet under your broiler to roast. Pestle is translated as tejolote in Mexico, but it is translated as mano (del mortero) or pilón in other countries.